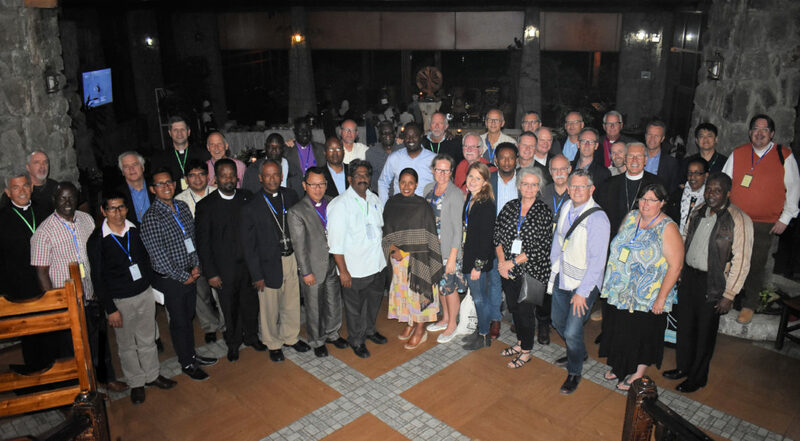 The Global Confessional and Missional Lutheran Forum (Global Forum) met September 4-6 at the Lisak Resort, Bishoftu, Ethiopia. In August 2015, at the invitation of the North American Lutheran Church (NALC), the gathering of Lutheran church leaders and representatives of reform and renewal communities throughout the world convened, in conjunction with the NALC Lutheran Week in Dallas, TX. The Global Forum met for the second time during the 2016 NALC Lutheran Week in Anaheim, CA and in 2017 in Nashville, TN. The decision was made during the Nashville gathering to meet in East Africa in either 2018 or 2019. Due to the support and encouragement of the Norwegian Lutheran Mission (NLM), the Evangelical Lutheran Church in Tanzania (ELCT), the Ethiopian Evangelical Church Mekane Yesus (EECMY) and the North American Lutheran Church (NALC), the dream of meeting in Africa became a reality. The Global Confessional and Missional Lutheran Forum will provide support and encouragement for those who are working for the reform and renewal of the Church throughout the world. The character of the Forum will be a confessional and missional alliance in accordance with the witness of the Holy Scriptures and as affirmed in the Lutheran Confessions. The Forum will engage in biblical and theological reflection and will stimulate strategies that will carry out the mission Christ gave to His Church—namely, to make disciples of all nations. The Forum will aim at equipping all believers to share their faith in Christ. The intention of the Forum will be both the renewal of the Church and the outreach of the Gospel to those who have not yet believed in Christ. The stated theme of the 2018 gathering was missionary discipleship, especially as it is being lived out within the East African context. The forum included presentations by the Rev. Dr. Fredrick Shoo, presiding bishop of the Evangelical Lutheran Church in Tanzania (ELCT) and the Rev. Yonas Yigezu president of the Ethiopian Evangelical Church Mekane Yesus (EECMY). They spoke on the mission context in their countries, highlighting challenges and opportunities. Keynote presentations on discipleship were offered by the Rev. Dr. Lalissa D. Gemechis, director of the EECMY Department of Mission and Theology, and the Rev. Dr. Nathan Yoder, NALC pastor, member of the NALC Commission on Theology and Doctrine and member of the NALC Life-to-Life Discipleship Team. A panel of denominational leaders responded to the keynote presentations and offered reflections on discipleship and mission within their particular churches and contexts. This Global Forum is taking place here in Ethiopia in a very special time in the history of Ethiopia. We in Ethiopia are going through so much political and social change in this country. We have new leadership in the country. Our nation is hopeful and excited about the future of our country. We welcome you with that excitement and joy. At the same time our church continues to grow at a very rapid pace. In the middle of this rapid growth the major challenge we are facing is lack of strategic congregational and denominational acts of enhancing and advancing discipleship. Therefore, this year’s Global Forum focus on discipleship is right on target! Furthermore, hosting this year’s Global Forum brings us a great joy and very deep contentment to see all of you from all over the world here in Bishoftu, Ethiopia. The Global Forum outside Addis was a memorable event and very significant. The event which took place for the first time in East Africa is a recognition of what the Holy Spirit is doing in this part of the globe. The Lutheran church in East Africa is growing very fast despite the challenges. The cooperation between the ELCT, EECMY, NALC and the Global Forum is very important for furthering the kingdom of God as we work together in making matured disciples. The Global Forum brought us to Addis Ababa to bring unity with our brothers and sisters in Africa and with the rest of the world in mission, discipleship and leadership. Our aim is to facilitate and create a space where churches, reform movements and mission groups can come together and share their vision, experience and passion for the common expression of Christian unity in mission and disciple making. We in North America and Europe have so much to learn from our brothers and sisters in Africa particularly from the largest Lutheran churches in the world in Ethiopia and Tanzania. The North American Lutheran Church is firm in our commitment to this global, ecumenical and confessional movement, as we advance the mission and ministry of the Gospel. The number of participants and countries represented more than doubled in 2018, due to the intentional goal of becoming less “north-centric” and more global. Forty-three representatives were present from fifteen nations, including Bolivia, Canada, Denmark, Ethiopia, Germany, India, Indonesia, Kenya, Mongolia, Norway, Peru, South Sudan, Sweden, Tanzania and the United States. The Global Forum participants formed a task force to develop and implement, as soon as possible, a global platform for confessional and missional theological education. The goal is to provide opportunity for courses to be offered globally in an online, cost-effective, convenient format accessible to all who desire Lutheran education grounded in the truth and authority of the Word of God, faithful to the Lutheran Confessions, driven by mission and discipleship. We intend this Bishoftu Letter to be a summary and clarification of the teachings that are our biblical and confessional heritage. We are also issuing a call—an invitation to Lutherans worldwide to confess, repent, be renewed, reformed and refocused by the Word of God, that together we may be a witness to the world, bringing others to Jesus Christ as Lord and Savior. This letter also serves as our response to certain errors that have recently arisen among and within certain churches of the Lutheran confession. through refocusing—turning us back to the mission Christ gave to His Church. The Bishoftu Letter to the Lutheran Churches is released as an open letter and may be found online at, globalforum.co. It is being translated into Spanish, German, French and other languages by Global Forum participants, and will be available in due time.